Industrial workmen Trainee Grade - 1 and 57 Assistant Manager Jobs. Bharatiya Reserve Bank Note Mudran Private Limited announced Latest Job Vacancy Notification 2017 for applicants who wish to apply for the posts of Assistant Manager and Industrial Trainee Recruitment of BRBNMPL. No other mode of Application will not be recognized. Candidates are advised to apply online between 14-February-2017 to 28-February-2017. Selection for this BRBNMPL Industrial Workmen and Assistant Manager Jobs Recruitment 2017 will be held through written test only. 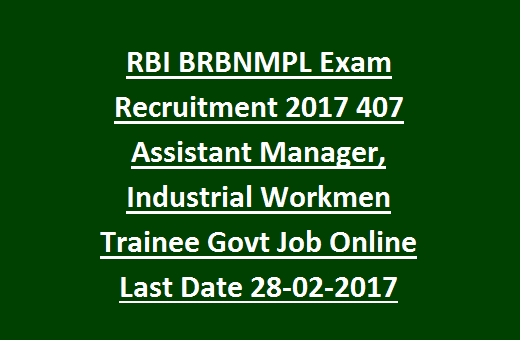 For more details regarding BRBNMPL Recruitment 2017 Assistant Manager, Industrial Workmen Jobs Exam Pattern, Syllabus, Educational details, Age limits and more information is given below. Bharatiya Reserve Bank Note Mudran Private Limited , a fully owned subsidiary of Reserve Bank of India (RBI)which manages its presses across India from south to North. One at Mysore in Karnataka and other at Salboni in West Bengal. Its having Corporate Office at Bangalore which encourage applications from eligible candidates for the posts for filling up of 407 posts across India in various branches in Bharatiya Reserve Bank Note Mudran Private Ltd Recruitment 2017. The BRBNMPL Hall Ticket can be downloaded prior to 15 days before the exam date. There are total 407 vacancies available in this current recruitment of BRBNMPL Industrial workmen Grade-1 (Trainee) and Assistant Manager Jobs. Available vacancies and posts details are given below. For the total 407 Posts, 350 posts of Industrial workmen Grade - 1 (Trainee) and 57 posts of Assistant Manager Posts are available. Selected Candidates will initially be on training period of one year. In the Training period candidates will be paid an amount of Rs. 16000/- per month as Stipend. They will be given certain additional allowances as per the rules of the Company. The Candidates Age should be between 18 Years to 28 Years as on 28/02/2017. Candidates upper age limit is 31 years. Candidate should have born after 01-03-1986. For Industrial Workmen Trainee Recruitment: The Candidate should qualify Diploma Degree in Printing hold minimum 55% from a Government recognized University/Institute. For further information about the educational eligibility criteria please refer the below Advertisement details. For Assistant Manager Recruitment: For Assistant Managers B.E/B.Tech/AMIE with 60% of Marks (For SC/ST 55%) in any one of the Engineering Discipline of Mechanical/Electrical/Electronics/Printing Technology from a recognised university. Selection is based on Written Test and Personal Interview. The Written Exam is tentatively on 6th August 2016. The exact date , time and venue will be mentioned in the call letter and the candidate can also refer the details in the company website. Exam Syllabus for General Science consists of Physics & Science syllabus of 10th standard CBSE. 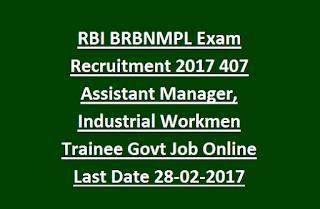 Eligible and willing candidates can submit their application form online on or before the closing date of 28-02-2017 through the official website of www.brbnmpl.co.in and click on the carees links, These select the apply online option and a new window will open which is directed to IBPS recruitment portal. There you have to register and submit the application form online. Please share this BRBNMPL Latest Posts vacancy details with your Near and Far Loved Ones. Our website Govt Job Online presents latest recruitment notification of 2016 for all State and Central government jobs. we broadcast our focuses on banking and Railway jobs.